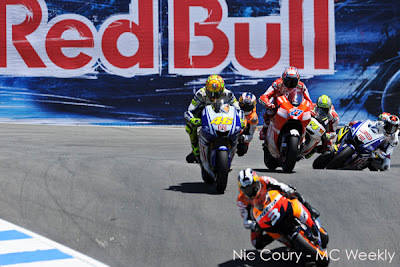 2009 U.S. Moto GP winner Dani Pedrosa leads the pack down the corkscrew on the first lap. 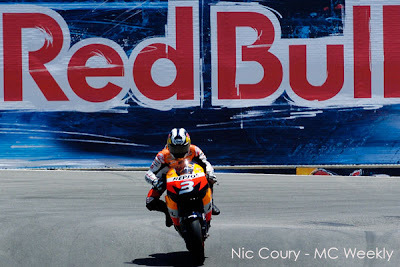 The 2009 U.S. Red Bull Moto Grand Prix weekend has finished. It's now only second to bike racing as my favorite sport to photograph. The entire weekend was great. 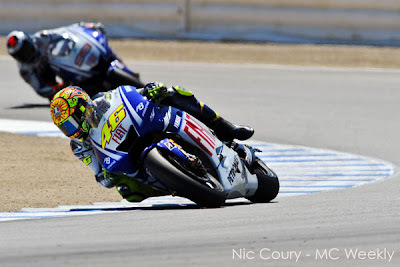 Shooting bikes moving at speeds upwards of 200 mph is very difficult and creating different shots than all the other photogs is hard as well. 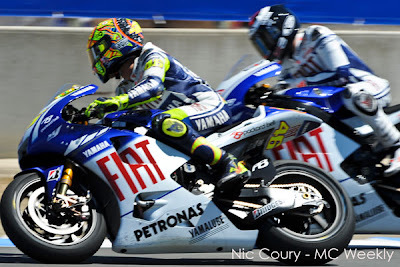 Fiat Yamaha teammates Valentino Rossi (foreground) and Jorge Lorenzo pass turn 3. 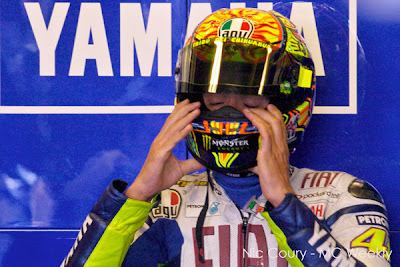 On Sunday morning, prior to the main race, I got to shoot in the Fiat Yahama garage where Valentino Rossi was prepping with his team. I made some very nice feature shots of him. 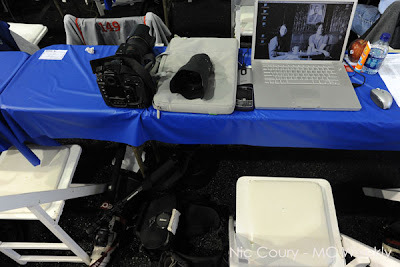 Below is my workspace in the media center where I spent lots of time editing photos and posting slideshows to the web. Oh, and drinking all the Red Bull I could handle. 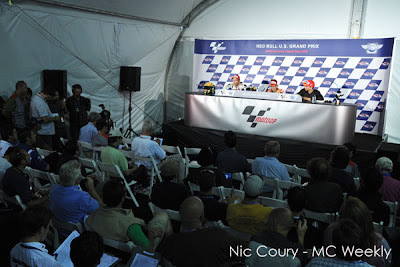 Below is the press conference room, shot with Sunday's three winners. 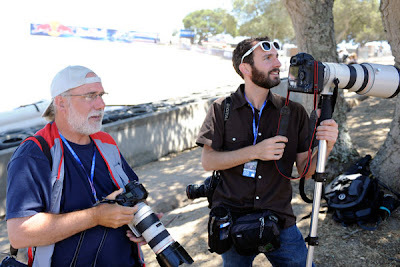 My buddies Orville Meyers of the Monterey Herald and Scott MacDonald of the Salinas Californian hang out in the photo area at the corkscrew on Sunday before the race. 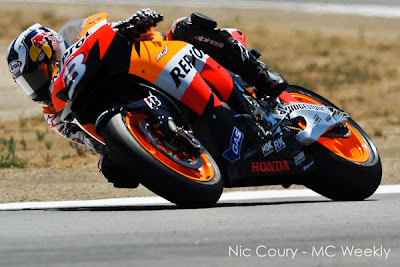 Race winner Dani Pedrosa enters the corkscrew. 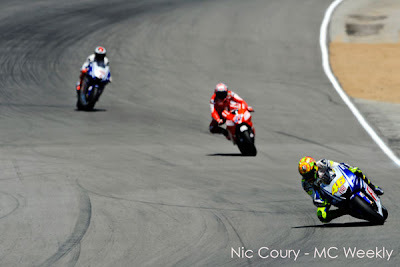 Valentino Rossi leads Casey Stoner (center) and Jorge Lorenzo into turn 10. 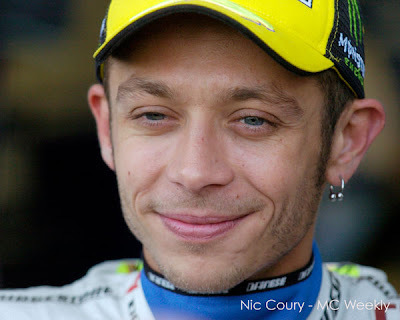 Rossi leads Lorenzo around turn 3. 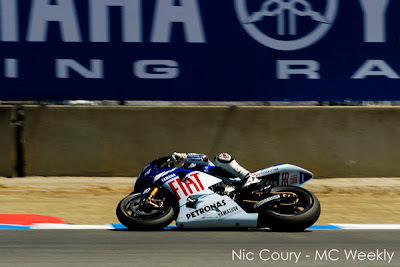 Lorenzo passes his team's sign at turn 3. Using the Sun on a Sunday.